Ricotta and Spinach en Croute, Thyme for Cooking healthy gourmet cooking. En Croute is in a crust or case. It's a wonderful way to cook a lot of foods, it can be assembled earlier and baked at the last minute and it's always impressive. Plus, if you buy the pastry, it's easy. If made ahead, brush with egg just before baking. 1 - 2 sheets of puff pastry, you'll need 2 sheets about 7" (17cm) square. If they are not big enough you can roll them out a bit (using a rolling pin). You could also use a large square cut from corner to corner as a triangle. Remove 1 tbs of beaten egg to a small bowl or measuring cup. Add spinach, nutmeg and ricotta to bowl with remaining egg and mix well. Prepare pastry if necessary (roll, cut, whatever, to get the size you need). 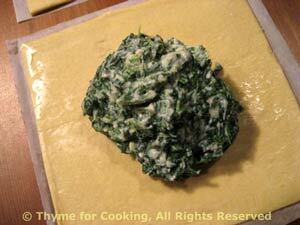 Mound half of the spinach mixture into the center of each pastry sheet. Bring corners together over top and press together, making a little parcel. You want to seal the corners or tips but not all the seams, so that it can expand but not come apart. Brush the top with the little bit of beaten egg you reserved. Put the parcels on a baking sheet and bake at 400F (200C) for 15 - 20 minutes, until the pastry is golden brown. Heat oil in a small sauce pan over medium heat. Add shallots and garlic and sauté until tender, about 5 minutes. Drain the tomatoes, discarding juice. Roughly chop the tomatoes and add to the saucepan, along with the juices from chopping and the rest of the ingredients. 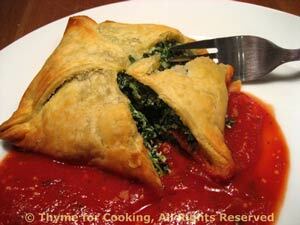 Remove Spinach Pastries when done and serve with the tomato sauce on the side.